Update (August 2015): The chart and data have been updated to include 2013 and 2014. The trend continues. The mortgage rate continues to fall (to 3% for 2014). This, together with moderate increases in the mortgage-payment-to-salary ratio (up to 82% in 2014), result in significant increases in the apartment-cost-to-salary ratio – almost 150 in 2014. 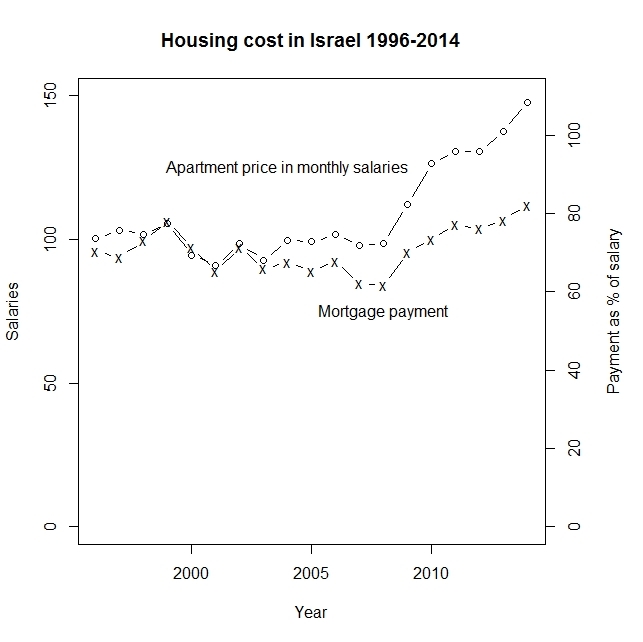 Apartment prices in Israel have gone up significantly in recent years. In the years 1996 to 2008, an average apartment cost about 100 average salaries. Within two years, this ratio has gone up to about 130. This rise can be explained to a significant extent by the reduction in interest rates, which implies that a given mortgage payment can repay higher loans. The interest rate on an indexed 20 year mortgage has fallen from about 6% in the late 1990’s and early 2000’s to about 3.5% in 2010 to 2012. As a result, despite the 30% increase in apartment cost to salary ratio, the ratio of the monthly payment on a 20 year loan for the cost of an average apartment to the average salary has gone up much more moderately – from about 70% to about 80%. The fact that the increase in apartment prices is associated with a decrease in interest rates raises the possibility that a future rise in the interest rates (which would bring them close to historical rates) would cause a return of the apartment cost to salary ratio to its previous level. Average monthly salary (nominal): Social security data (social security law, section 1), similar to statistical abstract 2012, Table 12.34, but more up to date, using the January 1st 2013 entry as reflecting 2012 data, etc.